Reading and share top 180 famous quotes and sayings about Circus by famous authors and people. 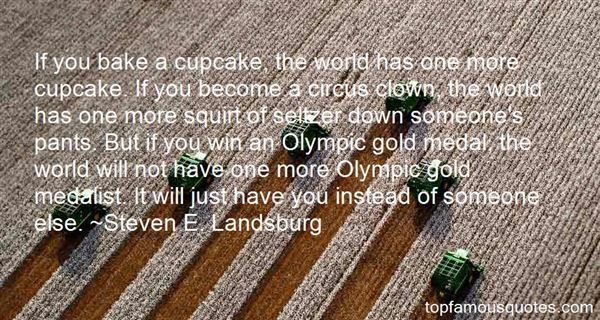 Browse top 180 famous quotes and sayings about Circus by most favorite authors. 1. "Hell - you'll be lucky to join the circus! ""I don't need to join the circus." Ethan stretches his arms to the sky, bored with the entire situation. "I live with you, don't I? ""He so got Tad there," I whisper." 2. "I write because I want more than one life; I insist on a wider selection. It's greed, plain and simple. When my characters join the circus, I'm joining the circus. Although I'm happily married, I spent a great deal of time mentally living with incompatible husbands." 3. "Many of the network television shows have done takeoffs on 'Family Circus,' including 'David Letterman,' 'Friends,' 'Roseanne,' and others, and, in my estimation the use of them is a compliment to the popularity of the feature, which just by mentioning it's name sets up the image of a warm, loving family-type feature." 4. "They're selling postcards of the hanging They're painting the passports brown The beauty parlor is filled with sailorsThe circus is in townHere comes the blind commissionerThey've got him in a tranceOne hand is tied to the tight-rope walkerThe other is in his pantsAnd the riot squad they're restlessThey need somewhere to goAs Lady and I look out tonightFrom Desolation Row." 5. "...take down your baby bump photos from Facebook, take down pictures of your kids too. It is your job to protect your children and not parade them around like little circus freaks or glorified mini-you's. (Excerpt from the Blog Posting "Kim Kardashain; Mother of the Year!" http://wp.me/p2OOUh-q"
6. "A circus is like a mother in whom one can confide and who rewards and punishes." 7. 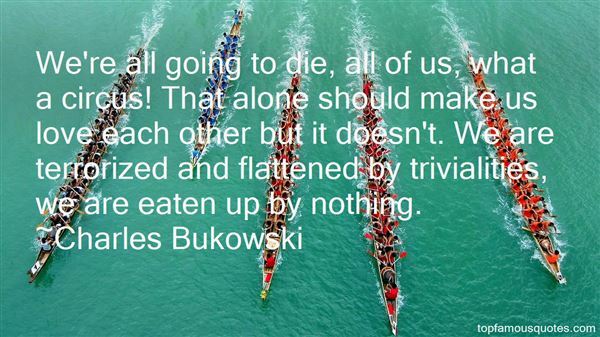 "We're all going to die, all of us, what a circus! That alone should make us love each other but it doesn't. We are terrorized and flattened by trivialities, we are eaten up by nothing." 8. "This is the circus of Dr. Lao.We show you things that you don't know.We tell you of places you'll never go.We've searched the world both high and lowTo capture the beasts for this marvelous showFrom mountains where maddened winds did blowTo islands where zephyrs breathed sweet and low.Oh, we've spared no pains and we've spared no dough;And we've dug at the secrets of long ago;And we've risen to Heaven and plunged Below,For we wanted to make it one hell of a show.And the things you'll see in your brains will glowLong past the time when the winter snowHas frozen the summer's furbelow.For this is the circus of Dr. Lao.And youth may come and age may go;But no more circuses like this show!" 9. "One day the good times had to keep on rolling, and all of life's horseshit would turn to circuses." 10. "So we see Edward as a young man on the road and he meets a giant and he brings the giant to a circus where he meets a Miss Calloway. He sees the woman of his dreams and I am the only one who knows who she is." 11. "My house is like living with the circus. All we need is a midget and a bearded lady. Well, all we need is a midget." 12. "The students that, like the wild animal being prepared for its tricks in the circus called 'life', expects only training as sketched above, will be severely disappointed: by his standards he will learn next to nothing." 13. 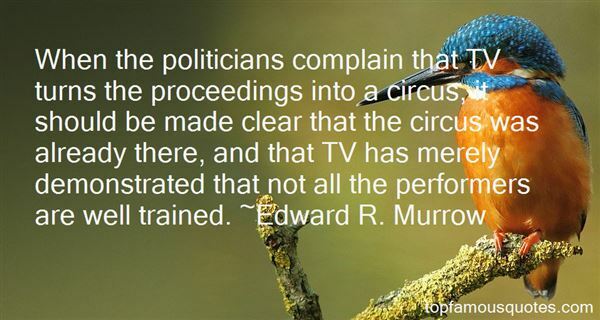 "When the politicians complain that TV turns the proceedings into a circus, it should be made clear that the circus was already there, and that TV has merely demonstrated that not all the performers are well trained." 14. "What's this?" he inquired, none too pleasantly. "A circus? ""No, Julius. It's the end of the circus. ""I see. And these are the clowns? "Foaly's head poked through the doorway. "Pardon me for interrupting your extended circus metaphor, but what the hell is that?" 15. "Orion sniffed. "Good. Then, worthy centaur, perhaps you could give me a ride to the village on your back. Then I can make a few pennies with my verses while you build us a shack and perform circus tricks for passerby. "This was such a surprising statement that Foaly briefly considered jumping into the hole to get away." 16. "The circus itself is my personal ideal entertainment venue." 17. "They are enthusiasts, devotees. Addicts. Something about the circus stirs their souls, and they ache for it when it is absent. They seek each other out, these people of such specific like mind. They tell of how they found the circus, how those first few steps were like magic. Like stepping into a fairy tale under a curtain of stars… When they depart, they shake hands and embrace like old friends, even if they have only just met, and as they go their separate ways they feel less alone than they had before." 18. "You think, as you walk away from Le Cirque des Rêves and into the creeping dawn, that you felt more awake within the confines of the circus. You are no longer quite certain which side of the fence is the dream." 19. "I wish that the circuses that were around now felt like they did then. They're not quite as elegant or as magical as they used to be. There was something about the old tent shows, the Big Top, the canvas, the lights, the sawdust, the hay and the animals that's just missing now. Now, it's all urbanized and maybe a little garish." 21. "I was driving pretty much the way everyone drives in LA, like elephants dancing on each others' backs at a circus." 22. "Democracy is the art and science of running the circus from the monkey cage." 23. "The Circus-Circus is what the whole hep world would be doing Saturday night if the Nazis had won the war. This is the sixth Reich. The ground floor is full of gambling tables, like all the other casinos . . . but the place is about four stories high, in the style of a circus tent, and all manner of strange County-Fair/Polish Carnival madness is going on up in this space." 24. "Hallucinations are bad enough. But after awhile you learn to cope with things like seeing your dead grandmother crawling up your leg with a knife in her teeth. Most acid fanciers can handle this sort of thing. But nobody can handle that other trip-the possibility that any freak with $1.98 can walk into the Circus-Circus and suddenly appear in the sky over downtown Las Vegas twelve times the size of God, howling anything that comes into his head. No, this is not a good town for psychedelic drugs." 25. "Hector wished suddenly that leaving the circus was as easy as joining. He didn't fancy the ghost of Harvey Burfoot hunting him down and passing judgement on him. Troupe mythology varied on the details – some said he had the ability to stop your heart with just a stare, others that he strangled you with corporeal hands that grew stronger as he drained your life-force. Either way, the Law was that nobody left; to leave was death; and Hectordidn't hate himself that much yet." 26. "Motherhood has relaxed me in many ways. You learn to deal with crisis. I've become a juggler, I suppose. It's all a big circus, and nobody who knows me believes I can manage, but sometimes I do." 27. "A brick could be wrapped in plastic and sold individually to toddlers as toys. (Warning: Bricks can be harmful if swallowed. If ingested, please contact a physician first, and then the manager of a circus.)" 28. "I knew why I was claustrophobic, all right. But knowing why didn't make it go away. I wondered what it would be like to see the dark blue sky above us not as heavy drapes of cloth, the top of a circus tent, but as an infinite expanse. As everybody else saw it." 29. "If you had to pack your whole life into a suitcase--not just the practical things, like clothing, but the memories of the people you had lost and the girl you had once been--what would you take? The last photograph you had of your mother? A birthday gift from your best friend--a bookmark embroidered by her? A ticket stub from the traveling circus that had come through town two years ago, where you and your father held your breath as jeweled ladies flew through the air, and a brave man stuck his head in the mouth of a lion? Would you take them to make wherever you were going feel like home, or because you needed to remember where you had come from?" 30. "You damn fool!" one of the men grated in angry concern as they both squatted down on their haunches and peered anxiously at her. "What the hell do you think you're doing? "Bracing herself on her forearms, Lauren lifted her chagrined gaze from the man's shoes to his face. "Auditioning for the circus," she told him dryly, "And for an encore, I usually fall off a bridge. "A rich chuckle sounded from the other man as he took her firmly by the shoulders and helped her to her feet. "What's your name?" he asked, and when Lauren had told him,he added worriedly, "Can you walk? ""For miles," Laruen assured him unsteadily. Every muscle in her body was protesting, and her left ankle was throbbing painfully. "Then I guess you can make it as far as the building so we can have a look at the damage," he said with a smile in his voice." 31. "Next to a circus there ain't nothing that packs up and tears out faster than the Christmas spirit." 32. "The circus had been unlike anything I could ever imagine and I could not walk away. I wanted to be a part of the magic, create it and wield it with such skill that it looked effortless. I wanted to fly." 33. "KISS Psycho Circus is my current favorite. I'm not ashamed to say that I prefer the mindless fun of blasting hordes of creatures to exploration or adventure games." 34. "Only in the circus, life will get better"
35. "The reason you cannot see the Mouse Circus," said the man upstairs, "is that the mice are not yet ready and rehearsed. Also, they refuse to play the songs I have written for them. All the songs I have written for the mice to play go oompah oompah. But the white mice will only play toodle oodle, like that. I am thinking of trying them on different types of cheese." 36. "I am an invisible man. No, I am not a spook like those who haunted Edgar Allan Poe; nor am I one of your Hollywood-movie ectoplasms. I am a man of substance, of flesh and bone, fiber and liquids--and I might even be said to possess a mind. I am invisible, understand, simply because people refuse to see me. Like the bodiless heads you see sometimes in circus sideshows, it is as though I have surrounded by mirrors of hard, distorting glass. When they approach me they see only my surroundings, themselves, or figments of their imagination-- indeed, everything and anything except me." 37. "Yet it had been delicious to touch her grandfather's robe. It was as different from ordinary material as something sung from something spoken. In a way she liked her grandfather. Once she had seen children crawling under a circus-tent so that they could see the elephant, and she would have done that to see her grandfather; and what she like in him was the upside-downness of him, as this inverted luxury which gave him an everyday possession--for she supposed this robe was just a dressing gown--which was uniquely exquisite..."
38. "The kind of happy I was that day at the Vet when "Hawk" Dawson actually doffed his red "C" cap to me, and everyone cheered and practically convulsed into tears - you can't patent that. It was one shining moment of glory that was instantly gone. Whereas life, real life, is different and can't even be appraised as simply "happy", but only in terms of "Yes, I'll take it all, thanks" or "No, I believe I won't." Happy, as my poor father used to say, is a lot of hooey. Happy is a circus clown, a sitcom, a greeting card. Life, though, life's about something sterner. But also something better. A lot better. Believe me." 39. "Precarious, life is. A flying leap. A sweep of hand. A star flung across the night. A lucky catch in this whirling juggling circus act.From Steam Drills, Treadmills, and Shooting Stars"
40. "Wise men have regarded the earth as a tragedy, a farce, even an illusionist's trick; but all, if they are truly wise, and not merely intellectual rapists, recognize that it is certainly some kind of stage in which we all play roles, most of us being very poorly coached and totally unrehearsed before the curtain rises. Is it too much if I ask, tentatively, that we agree to look upon it as a circus, a touring carnival wandering about the sun for a record season of four billion years and producing new monsters and miracles, hoaxes and bloody mishaps, wonders and blunders, but never quite entertaining the customers well enough to prevent them from leaving, one by one, and returning to their homes for a long and bored winter's sleep under the dust?" 41. "I did a cake for the 60th birthday of Elton John, for Britney Spears' 27th birthday and for the 'Circus' album she put out - the cake had circus themes. I prepared a cake for a surprise 82nd birthday event for the architect Frank Gehry; the cake was comprised of mini-replicas of his buildings." 42. "I never went to acting school. I started in the circus, music hall, I was in a group, did kids' bits. I've always had this kind of insecurity being uneducated." 43. "Did I tell you about Anton?" Loots said.Anton?" I shook my head.It was a week ago, Loots said. There had been a knock on the door of his apartment and when he opened it his old friend Anton was standing there. Anton was a clown. He belonged to a circus that toured the provinces, playing to small towns and villages. They talked about the old days for a while, but Anton became increasingly restless and distracted. In the end Loots had to ask him if there was something wrong.This is going to sound strange." The clown coughed nervously into his fist. "It's The Invisible Man. He's disappeared. "Loots stared at his friend.He just vanished," Anton said, "into thin air. "The Invisible Man?" Loots said.Yes. "He's disappeared? "I told you it would sound strange," Anton said." 44. "It would've been hard to do something else, to as it were, run away from the circus and become an accountant." 45. "Why the hell shouldn't I run away with the circus?" 46. "Stand still for a moment and whole world looks like a grand circus." 47. "If you bake a cupcake, the world has one more cupcake. If you become a circus clown, the world has one more squirt of seltzer down someone's pants. But if you win an Olympic gold medal, the world will not have one more Olympic gold medalist. It will just have you instead of someone else." 48. "I should have sold you to that traveling circus when you were four." 49. "John Cleese was with a group called Cambridge Circus, who had come to New York, and we became friends. Years later that produced a certain team effort." 50. "By reflecting a little on this subject I am almost convinced that those numberless small Circuses we see on the moon are the works of the Lunarians and may be called their Towns." You can learn little from victory. You can learn everything from defeat." Who Was Talking About "Circus"?